We went to Maine and celebrated with a special dinner out last night at Fore Street in Portland. Tonight, on the actual day, we treated ourselves to a home cooked meal: steaks on the grill dotted with leftover rosemary butter, fresh corn on the cob, green beans (dotted with more of the rosemary butter), and a salad. As I describe it to you, I realized the meal was a locavore’s dream. The steaks were from a steer raised by my brother-in-law’s father, the corn was from our favorite farm stand in Maine, the salad fixings were from this week’s CSA share, and I picked the green beans myself at the CSA. It was our favorite kind of home cooking, perfect for celebrating a homey event. For dessert, Howard wanted a bumbleberry pie. 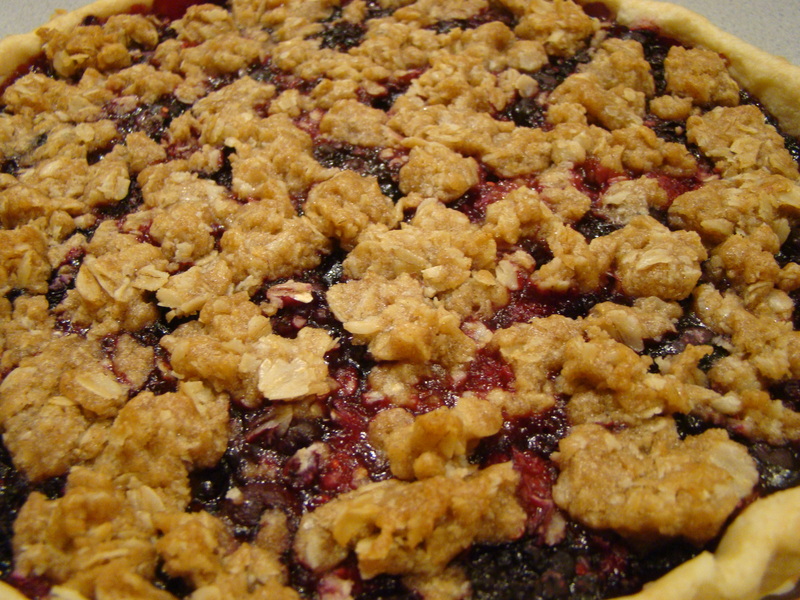 It’s a mixed berry pie topped with a crumble topping. We often get one at the farm stand in Maine. We stopped there on our way out of town, but they were sold out of that flavor. Howard was very disappointed. To make it up to him, I put together my own interpretation when we got home. I prefer making tarts instead of pies. I’m not sure why. I think it’s their elegant shape and how most tarts look like they could have come from a bakery. So, I made a bumbleberry tart for dessert. We have tons of berries in the freezer from picking earlier in the summer. I think you could make this with fresh berries but I didn’t try it. I tossed frozen raspberries, blueberries, and blackberries with some sugar and cornstarch. I filled the tart shell with berries and topped it with an oatmeal streusel topping that I use for fruit crisps. The cornstarch thickened the berry juices as they bubbled in the oven. The topping turned golden brown. Howard’s verdict? Thumbs up! Happy Anniversary, Honey! On a lightly floured surface, roll the dough into a 10-inch circle. Fit the rolled dough into pan and fold the edges back to the base of the tart to reinforce the sides. Prick all over with a fork and chill for at least 30 minutes to firm up. While the pastry bakes, make the topping (or you can do this a few days ahead). In the bowl of a food processor, combine the flour, sugar, cinnamon, and salt. Add the butter and process until clumps start to form (10-15 seconds). Transfer the mixture to a bowl. Add the oatmeal, and use your hands to combine. If you are making this in advance, store in the refrigerator. Preheat (or turn down) the oven to 350F. In a medium bowl, mix the sugar and cornstarch together, removing any lumps. Add the berries and stir until most of the sugar dissolves. 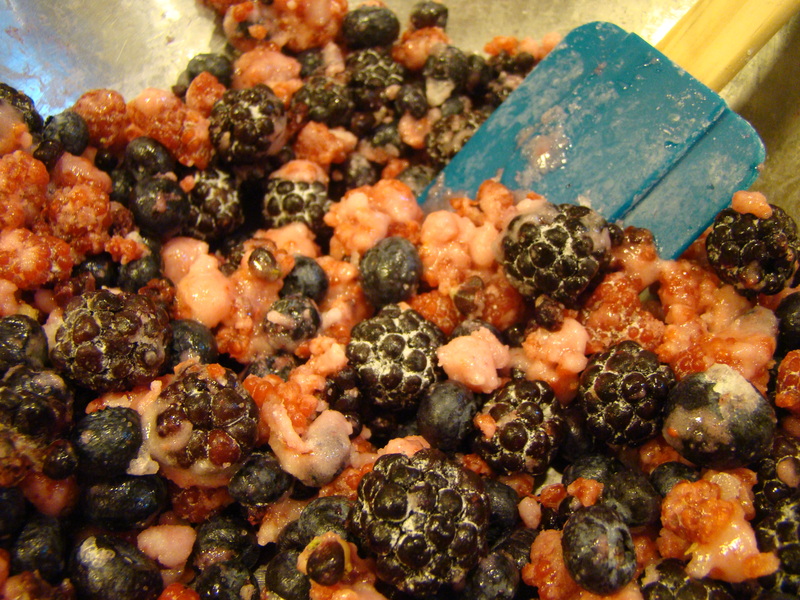 Transfer berry mixture to the tart shell. Sprinkle oatmeal topping over the berries. Bake the tart for 30-35 minutes, until the berries are bubbly and the topping is browned. Transfer the tart to a rack to cool. After 10 minutes, remove the rim of the tart pan. You can serve this warm or let it cool to room temperature. Store leftovers in the refrigerator.